Designed to remove pet hair from almost any surface, this tool is perfect for upholstery, but you'll soon find many other uses. It's one of the best fur removing tools available for furniture, but it also doubles as a grooming tool, and a scrub brush too. Use it to eliminate fur from couches and chairs in your living room, or use it in your vehicle to pull hair from crevices, and quickly clean the surface of your seats. You can even use it on clothing, drapery, bedspreads, pet beds or anything else. More than just a hair removal brush, you can also use it right on dogs and cats for grooming, and they may enjoy it more than the tool you're using now. The flexible bristles are far more gentle that common materials like metal, and it can even double as a scrub brush at bath time. 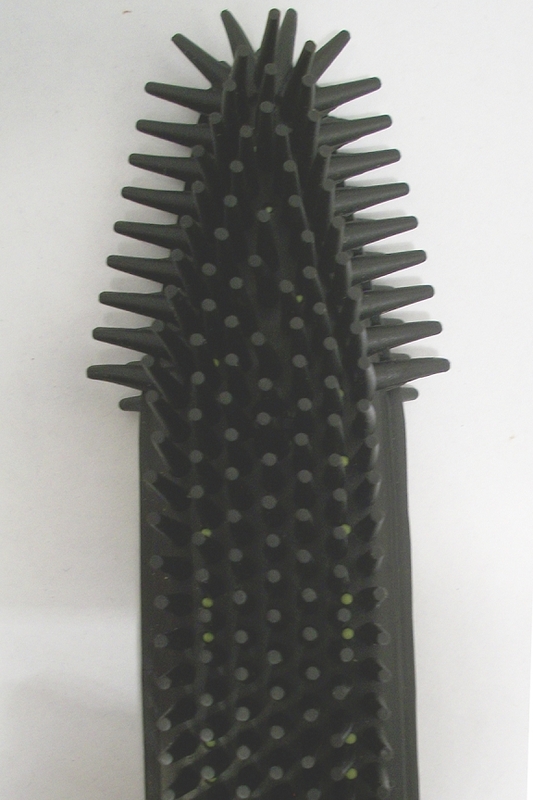 Similar to natural rubber, the TPR bristles are highly durable, and able to build a static charge when cleaning. This tool features an angled head for added convenience, and two rows of shorter, more rigid bristles at the top to ensure you can dig down into any crack you encounter. The head is molded right onto the handle, so it will never fall apart, and thanks to the durable materials that are totally washable, it will work like new, and last for many years of constant use. Versatile. Other brushes are only good for one job. This one can handle hundreds. Get one to always have fur-free furniture, and then find out all of the other chores it's good for. High Quality. Molded from a high quality TPR material, and manufactured in the USA for superior quality and performance. This tool is guaranteed to work well and withstand constant use without wearing out, losing shape, or any reduction in ability. Static Charge. As you clean, a slight charge will build. This helps to collect hair, and pull it out of upholstery. Charged fur will not fly away, so it will be easy to collect and eliminate. Extra Bristles. The pointy things at the top do more than add character. They also give you the perfect edge for cleaning into any tight place. Pull fur from between cushions, scrub grout lines, clean small areas and more. Durable & Long Lasting. Nearly indestructible, this brush will basically never wear out. The bristles wont break, bend or lose shape, and thanks to solid construction, it's pretty much impossible for it to fall apart. Use over and over again for years to come. Safe & Gentle. It will never leave marks or scratches on any surface, and it won't irritate pets if used for grooming. The gentle action is highly effective, but will never cause any harm. Flexible. Uneven surface? No problem. 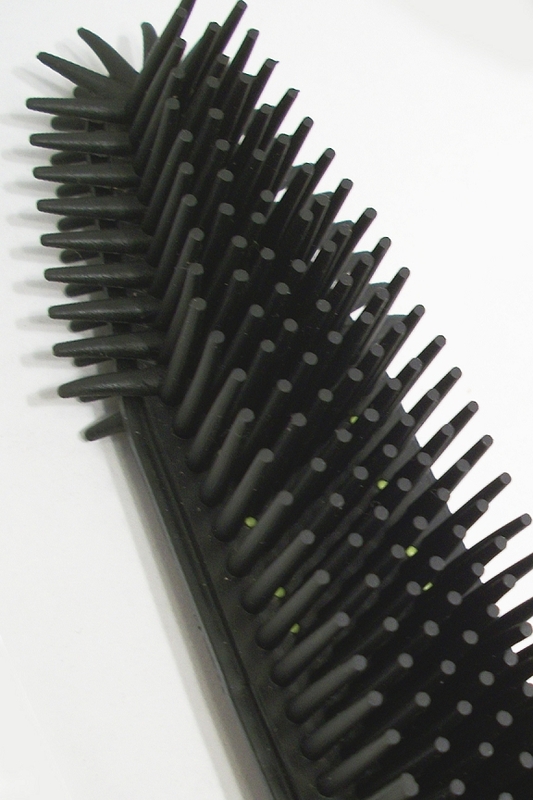 The flexible bristles will bend and flex to conform to any shape, and get down into any little crack. Thoroughly clean in less time, and with less effort. Indoors Or Out. Other tools would wear out quickly or fall apart if used on tough jobs outside. This one is different. Use it in your home, or outside, and use it for any job you can imagine. Grooming - Many animals have sensitive skin or temperamental attitudes, so using a regular grooming tool is not an option. The soft bristles on this brush still get the job done, but instead of scratching and irritating, they actually massage your pet's skin as you groom. Thanks to the static charge, you'll still be able to pull out loose hair, and thanks to the softer, pliable bristles, your dog or cat may actually sit in one place to let you. Just brush right through their coat to make them look good, give them a massage, and remove shedding fur at the same time. Scrubbing - Use it right on your pet at bath time, or use it for other scrubbing jobs around your home. The gentle action is perfect for deep cleaning Fido, but you can also use it for soap scum on your tub, bugs on your bumper, grime in your kitchen and so much more. It can handle any type of soap or cleaning solution you prefer, and the material is not affected by any amount of moisture. The TPR material is safe for all surface types, so wash your car, scrub your floors, clean vinyl siding, or deep clean anything else you can think of. Just add your favorite soap, along with some water, and scrub away. Sweeping - This tool is also a perfect hand-held sweeper. 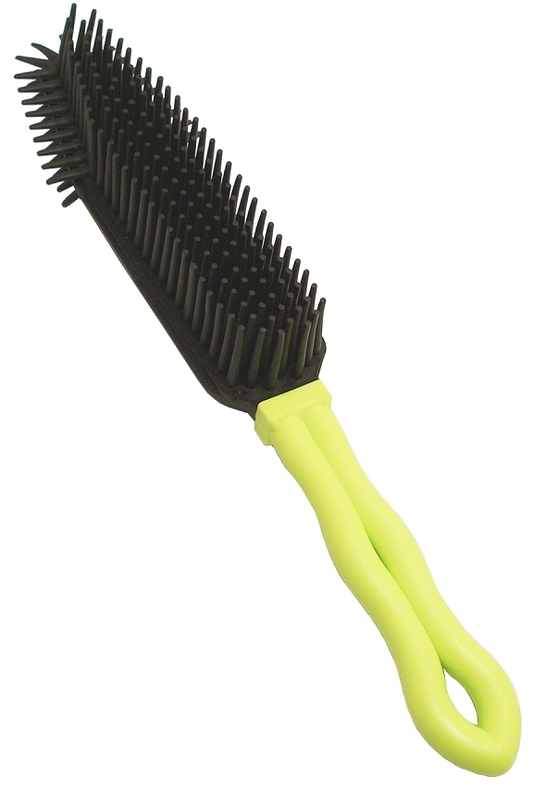 Use it where you would use any other brush or broom, and it will offer improved performance. It's ideal for any small mess on any surface, and it's highly efficient. The pliable material will form a solid wall as you sweep, so every last piece will be swept up with little effort, and you'll never have to worry about fine particles that get missed, or light ones that fly through the air. Best results will be had by pulling it towards you, but you can also use it like any other cleaning brush. Upholstery Cleaning - Pull hair out of cracks and crevices, and eliminate every last strand with ease. This tool is powerful on furniture, and it's safe for any material. Use a pulling motion to collect the fur, and use short strokes to build a strong charge. The hair will pull out of the fabric in order to pile in front of the brush as you work. Continue pulling toward yourself until the whole area is clean. It's perfect for cars and trucks, and ideal for any furniture in your home. It even works well on carpeted surfaces to eliminate fur that vacuums leave behind. Stop struggling with that mediocre brush you have now, but don't settle for furry couches, and hair on your clothes. The Ultimate Upholstery Brush will quickly remove human hair, or pet hair from any surface, and because you can use it right on your pet, it provides extra value that others can't match. When compared to other options out there, this one is easier to use, and allows for more thorough results. It's guaranteed to perform, and the superior materials and construction ensure that it will last for a long time. You don't have to live in a house full of fur, and you don't have to work like crazy, or get rid of your pet to eliminate it either. Start using this tool to clean small areas, and you'll wonder how you ever got along without it. Dimensions 10.75" x 2.25" x 1.5"
Head Size 6" x 1.75" x 1.4"
Uses Use for cleaning, scrubbing, grooming and more. It's ideal for removing fur from pets and furniture, but it also works as a scrub brush with soap and water. Surface Compatibility Soft and durable material is safe for all surfaces. Construction Solid piece. TPR head is molded onto the plastic handle and core. A powerful cleaning tool . Ideal for upholstery cleaning, but also useful for other stuff. Use it right on your pet, or use it to clean up after them. Order Yours Today! I'll admit I had my doubts, but this brush is truly amazing! I got some dog fur in a friends car and this brush took it off easily. The bristles on the tip worked great for nooks and crannies in the seats and the rest of the brush worked great on the flat parts of the seats. Brought the hair all to one spot and picked it up. Way better than taking duct tape to the seat like i was expecting to have to do. Definitely a purchase to make if you have pet fur in your life! New purchase and love it as much as regular 12"brush. Great for cat hair, anything. This upholstery brush is rubber and works fantastic. Removes all hair and lint with a light brushing. Super product and super customer service!!! Will be ordering again. Oh My..What a Great Hair Remover! Couple strokes across your sofa and the hair disappears! Must Buy for all my friends..